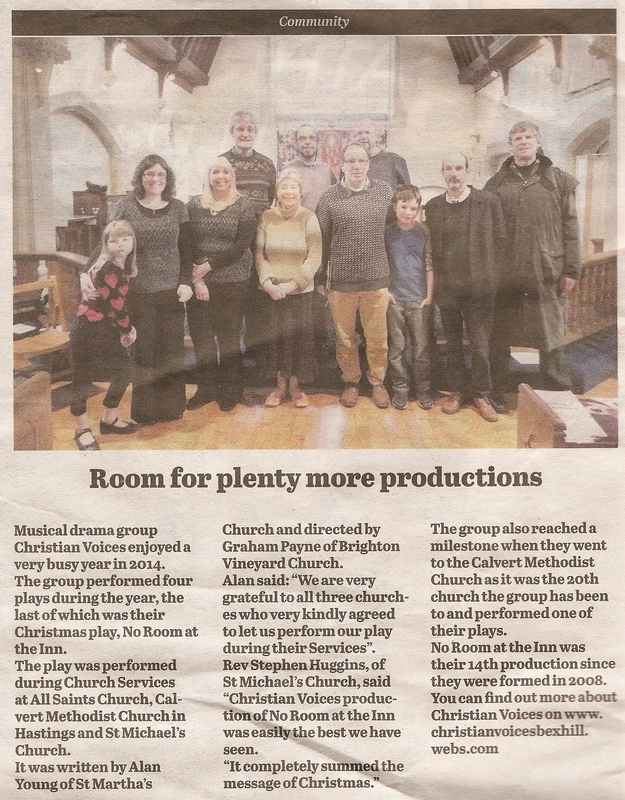 Below you will find the community bulletin from the Bexhill Observer on the 9th January 2015 regarding the Christian Voices production “No Room At The Inn“. Thanks to all those who attended and of course to our host churches All Saints, Calvert Methodist and St. Michaels. We had a great time putting on the seasonal play and it wonderful to hear comments like these. We’ve now put on fourteen productions and visited twenty churches. If you want us to bring our performances to your church, please contact Alan Young as per the details on our “Join Us” page. Posted by harlekwinblog on 11/01/2015 in Comments, News, Performances, Press and tagged Christmas, Comments, News, Performances, Pictures, Plays, Press.